Desert landscapes are a growing trend in modern decorating, and it’s more than just sun and sand. The Southwestern landscape encompasses a diverse range of textures and surprisingly bold colors. Whether you live in water-rich New England, or right in the middle of the concrete jungle, bring on the heat with some desert landscape decor. Wall art depicting the unique textures of the desert provides a great contrast to the often softer lines of basic home decoration. 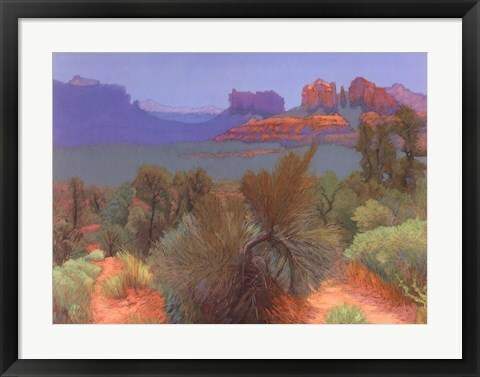 Desert landscape art depicts everything from cacti to the jagged silhouette of Monument Valley. There really is nothing like the patterns and textures of the Southwest. 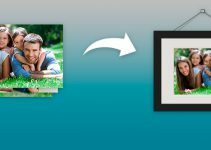 A panorama print of the landscape is a popular choice. Panoramas allow for enough space to really immerse your room with the desert vibe. The framed desert photograph below puts the funky outline of desert plant life on display in black and white. Other desert landscape silhouettes boast warmer colors and rocky shapes. There is endless diversity in the shapes and colors of the arid landscape. Photographs display the unique details of Southwestern scenery, but paintings bring on a new element. 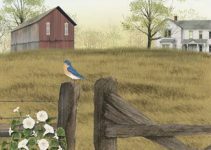 With paint, artists exaggerate colors and textures and really bring the landscape to life. Deserts are full of life, if you know where to look. More than 400 species of birds call the Southwest their home, as well as prairie dogs, horned lizards, and even foxes. Painters can capture this side of wildlife in a way that photographers can’t. 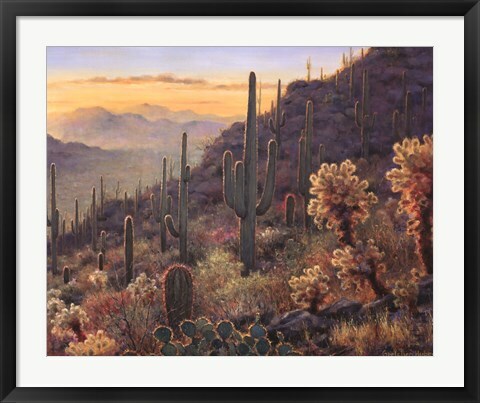 The most iconic image of the desert is the saguaro cactus (featured in many of this post’s images). Though it may be the signature plant, it’s far from alone on the arid frontier. Alongside the saguaro cactus, prickly pears, chollas, ocotillos, yuccas, and the incredible elephant tree thrive in the dry climate. Don’t cheat yourself–look for art that shows the wild side of desert life. 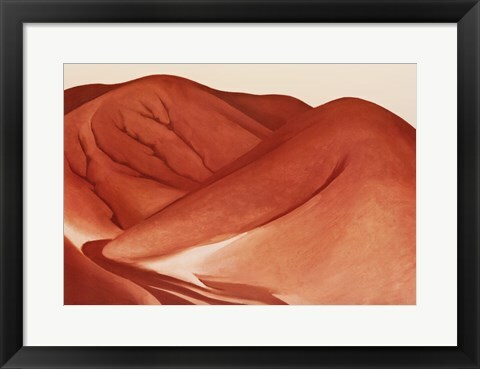 Another way to fill your space with the desert feel is through abstract framed art. The piece below is by famous artist, Georgia O’Keeffe. O’Keeffe is known for her large formats and abstract style. She had a way instilling vibrancy into still-life paintings. She does this for the Southwestern landscape through her painting, Red Hills, Grey Sky. She brings a new perspective sand, accentuating lines and shadows so that you can see the dunes in a new way. This piece is perfect for a study or den, providing a pop of color and a good dose of intrigue. Last but not least, most people who know about deserts know about mirages. Mirages are the mysterious optical illusions caused by the atmospheric conditions of arid areas. 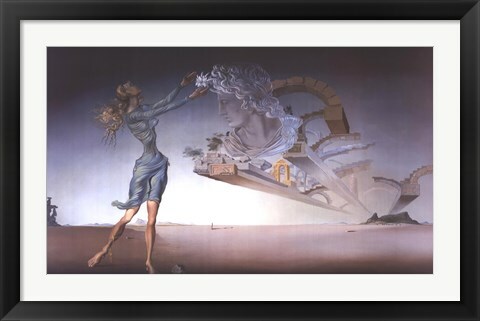 Renown surrealist painter, Salvador Dali, depicts his idea of a mirage in a painting by the same name. As usual, Dali gives us a truly unique take in his rendition of the landscape. We’re just showing you the tip of the iceberg… or dune, as it were. 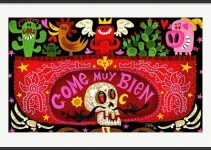 There are so many different amazing pieces of framed art that encompass the looks, feels, and life of the Southwest. Browse our entire collection for more inspiration!